Kick-It! Comics You Should Support: Episode 2 - i like comics too! Welcome to Kick-It!, the series that highlights comic book projects from crowd-funding platforms. For this second episode, I’ve decided to showcase three titles in the works: Little Maia and the Coral City, PANTHEON and Something Terrible. Keep in mind that because all these campaigns are on Kickstarter, your time to donate for perks is very limited! This project is the brainchild of Robert Geronimo, an artist and fellow Marvel alum. He “wanted to create a world that encourages kids to utilize their imaginations. It is a world that is created out of a love of good, visual storytelling and a desire to see strong female characters take the lead.” In the story, Maia’s house is swallowed by an enormous fish. She discovers Coral City in its gullet and makes new friends as she embarks on an adventure to get back home. Robert actually received positive responses from several publishers about his creation, with the one caveat being that they wanted Maia’s gender flipped. But he was adamant in keeping Maia a girl, since female empowerment was so central to his story… so now we have this Kickstarter! I think this project is brilliant for a few reasons. Obviously, I’m all game for more books that, as Robert said, “empower young girls” and show not only them but also young boys how girls “can be strong and independent.” I also love that there are no words to the story, so children are free to use their imagination and interpret each page as they will. This adds a sense of self-inclusion to the experience and makes the content available to a really wide audience, since even toddlers not yet able to read can enjoy it and we, as adults, are not limited by what would otherwise be very basic language aimed for younger readers. 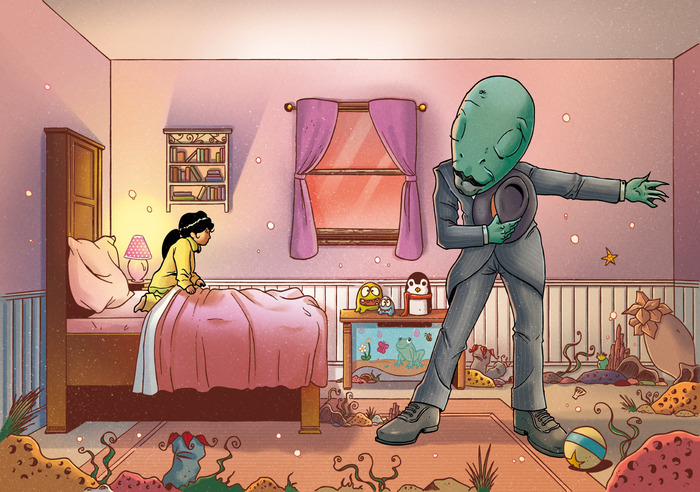 If you have kids or you’re as big a more here kid at heart as I am, check out Little Maia and the Coral City’s Kickstarter. Digital copies of the book are as low as $5. As a big fan of Egyptian mythology, I was instantly drawn to PANTHEON’s premise. The whole idea for the graphic novel started when Hamish did a little research and discovered that, when it came to the incredible stories of these deities, “the only books you could get were children’s books, which were very censored, and really dry academic textbooks.” So he decided to do something completely faithful to the original content, with a little added humor and “sexiness” for entertainment value. “Pantheon focuses on ‘the most important’ myth – the battle between Set and Horus for the throne of Egypt.” Hamish posted two pages of the graphic novel on his Tumblr and it quickly took off… for good reason! It’s the perfect combination of great art and witty dialogue. For £10 (about $16) you can get a digital copy of the entire graphic novel, which will total about 200 pages, plus goodies like digital posters. For a little more, you can get a physical copy and other fun stuff. 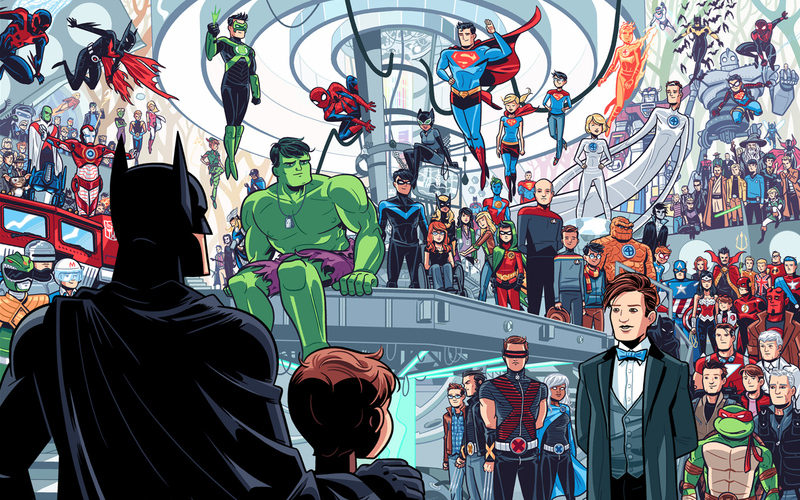 Something Terrible is a “short, autobiographical comic about recovery from childhood trauma and the power of fictional heroes.” I actually became aware of it because of one of its splash pages: a vibrant image of fictional characters that helped shape Dean’s life. After that, I read as much of the comic itself as Dean had posted. It’s a beautiful, haunting, moving story and you can actually download the entire thing for just $1 or order a physical copy for $15 on the Kickstarter. There are only a few hours left in that campaign, but not to worry: if you’re really interested in it, Dean has gradually been posting panels on his site, and even after the Kickstarter is over you’ll still be able to buy a digital version of the whole comic there. Crowdfunding sites (Kickstarter, GoFundMe, IndieGoGo, etc.) are becoming more and more integral to the indie comic book industry. They offer creators a chance to do what they love, and offer consumers a chance to not only contribute and encourage these “underground” writers and artists, but also to enjoy content that they would have otherwise never been able to access. Win-win for everyone! Stay tuned for more episodes of Kick-It!, and if you have suggestions for features in the future, feel free to comment below or send me a message.